The oldest deck of cards in the world has been stolen from the Museum of Ancient History in Solitaire Mystery: Stolen Power. Track down the missing deck and save the world using the magical cards. Grab the cards before they fall into an evil villainвЂ™s hands! Search amazing Hidden Object scenes as you try to complete the deck to unleash the powerful magic contained within. 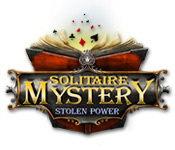 Use the cards for good in Solitaire Mystery: Stolen Power!